After importing the data for your choropleth map, you can now refine, annotate and design it in step 3: Visualize. In this tutorial, we'll walk you through the different options. In the Refine tab, you can find four tools: Color palette, Tooltips, Map labels and Map key. Make map zoomable makes...well, the map zoomable. You will see that this succeeded if your map gets a grey minus & plus button at its top-right corner. Choosing a column for your Map label will add labels to your map. You might not see them immediately. That's the case when your map is fully zoomed out (at zoom level 1), but your Minimum zoom for labels is something greater than 1. The higher the zoom level, the more you need to zoom in your maps to see the labels. Automatically generate legend: This option is checked by default. If you uncheck it, you get the option to create a custom map key. We'll tell you everything about that feature in this extra article. We recommend to write in the title what's interesting about the map – the one key statement that you want to show on this map, if you have one. E.g. "Unemployment highest in the south"
If you choose to highlight a region on your map, this region's label will be visible all the time; even on zoom level 1. If you can't select any elements, you need to go back to Refine > Map labels and choose a column. You can select multiple regions to highlight. In this tutorial, we gave a quick overview of all options that you have to customize your Choropleth map. 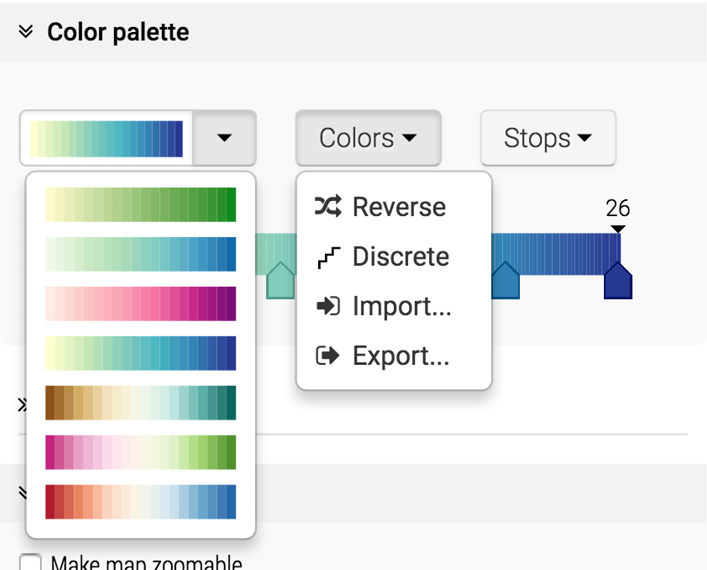 You can find more detailed explanations about the color palette, tooltips and custom map keys in other articles.